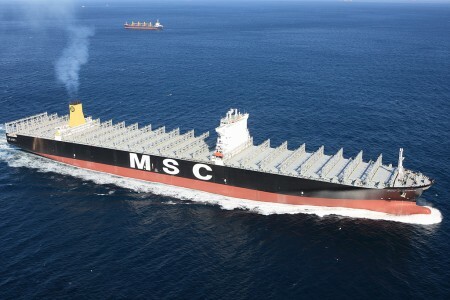 The MSC Daniela was built by Samsung Shipbuilding & Heavy industries Co. Ltd in South Korea and delivered to Mediterranean Shipping Company in December 2009. In terms of TEU capacity, she is the largest container ship ever built and able to accomodate up to 14,000 twenty-foot-equivalent containers. At an overall length of 366 meters, she is just slightly under the 397 meter Emma Maersk but able to carry more cargo due to technological advancements in ship design. Additionally, the vessel is the biggest container ship ever classed by Germanischer Lloyd (GL), a classification society based in the city of Hamburg, Germany. The MSC Daniela is extraordinary not only in terms of size, but also in its design aspects. To meet requirements for bridge visibility on the large containership, the Daniela’s design separates the engine room and the deckhouse. The latter’s position in the forward part of the ship permits an increase in container capacity and a reduction in ballast water. The ship’s design incorporates high-tensile steel to reduce bending increase stiffness in the hull. This reduces the thickness of the steel plate, for strong but lightweight construction. Mediterranean Shipping Company S.A (MSC) of Geneva, Switzerland is the worlds largest privately owned and operated shipping line with a worldwide fleet of 425 vessels with a TEU capacity of over 1,400,000 or over 11% market share according to AXS-Alphaliner. As a family owned and operated company MSC Daniela was named after the daughter of Mr Giuseppe Prudente, MSC Genevas Logistics Manager. In 1999, Samsung Heavy Industries developed a 6,200 TEU container ship, which was a world first at a time when 5,000 TEU ships were the norm. 7,700 TEU, 8,100 TEU, and 9,600 TEU ships followed soon afterwards. In 2006, SHI received an order to build a 13,300 TEU ship, the world’s largest container ship ever. Now, SHI is marketing 16,000 TEU class containerships completing the design. When it comes to construction of very large containerships, SHI is also leading the market building and delivering 8,500 TEU, 9,200TEU and 9,600 TEU ships in a row. As a result, SHI has become renowned for its unique technologies and reputation in the building of advanced container ships. The MSC Daniela is one of eight sisterships ordered from Samsung Heavy Industries and Daewoo shipyards in Geoje, South Korea. the following video was taken aboard her sistership, the MSC Kalina.